Happy National Donut Day! 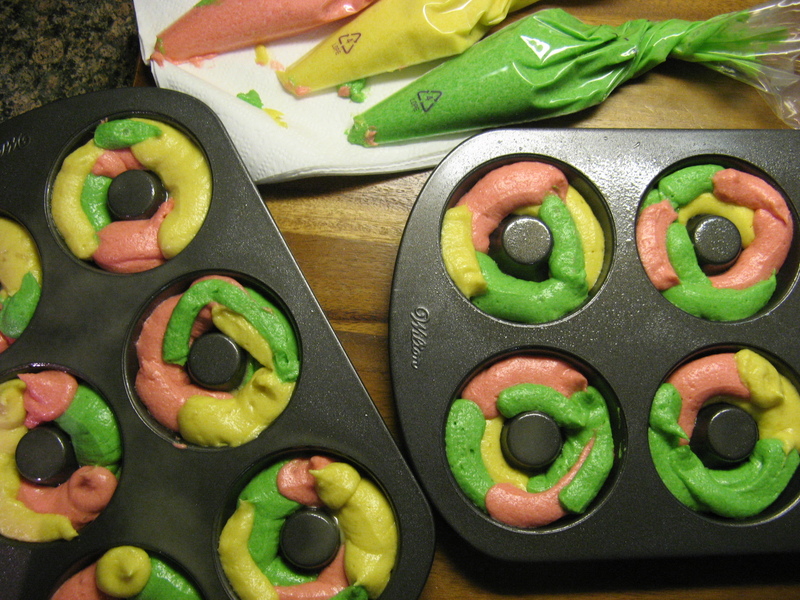 In honor of the day I decided to make Rainbow Cookie Donuts. 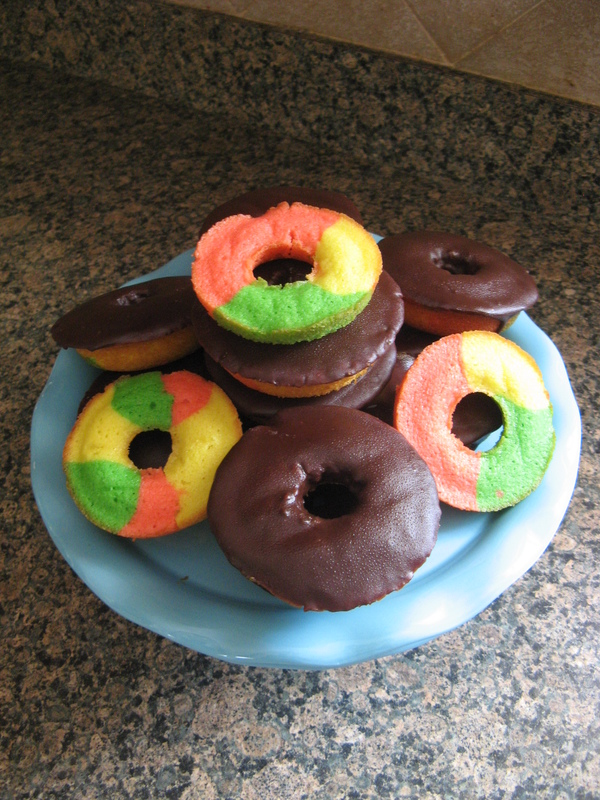 If you do a Google search for Rainbow Cookie Donuts you normally see a rainbow cookie – the tri-color cookie separated by raspberry jam and then covered in chocolate – shaped like a donut. A bit much if you ask me. I really wanted to make one similar to the one a coworker brought me from a local donut shop by her – Honey Pig Donuts. Instead of the donut being layered the colors were marbled together. 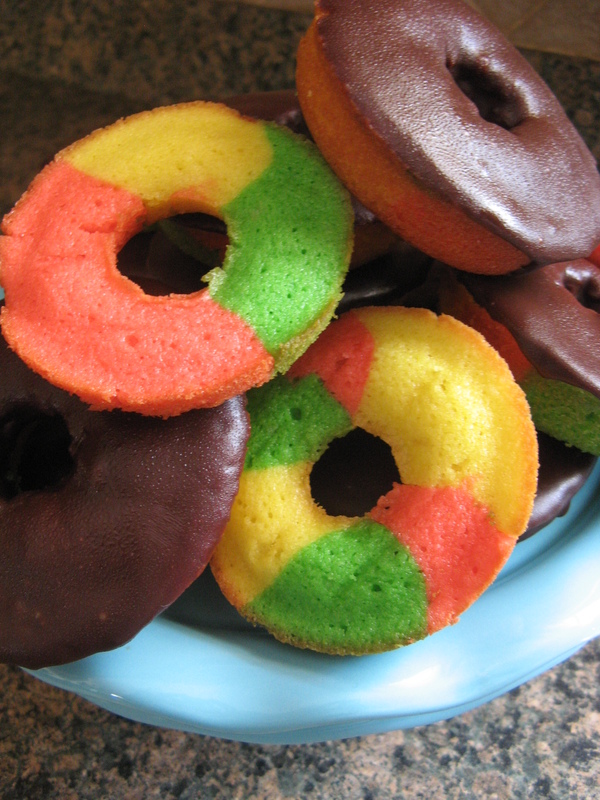 I knew that my go-to Rainbow Cookie recipe wouldn’t be right for these cookies… It’s not light enough and I would end up with a donut that would be quite dense. I was going to try and tweak the recipe to get the right texture, but, then I came across a Rainbow Cookie Cake recipe that would be perfect, once I halved the recipe. Once I made the batter I divided it in three and tinted each of them. I normally only tint the green and pink layer when I make the cookies, but, since I was making them in donut form I decided to tint the natural color layer with a bit of yellow so each part of the rainbow donut could stand out. Next, I transferred the batter to piping bags and snipped a small portion of the tip off and then piped the batter into donut pans that I sprayed with baking spray. I filled the cavities about 3/4 full and then baked them in a 350 F preheated oven for about 15 minutes. After the donuts had cooled I melted a few tablespoons of seedless raspberry jam in a small saucepan over medium-low heat to melt it. Once melted I used a brush to brush the tops of the donuts with the melted jam. While the jam settled I made the chocolate glaze. In a small saucepan over medium-low heat I combined chopped semisweet chocolate with heavy cream, vanilla extract and salt and stirred the mixture until it melted. Once melted and smooth I removed it from the heat and let it cool for about 5 minutes. I gave it a few more stirs and then dipped the tops of the donuts into the melted chocolate. After dipping them I placed them on a cooling rack that I set on a wax paper lined cookie sheet so the chocolate could set. 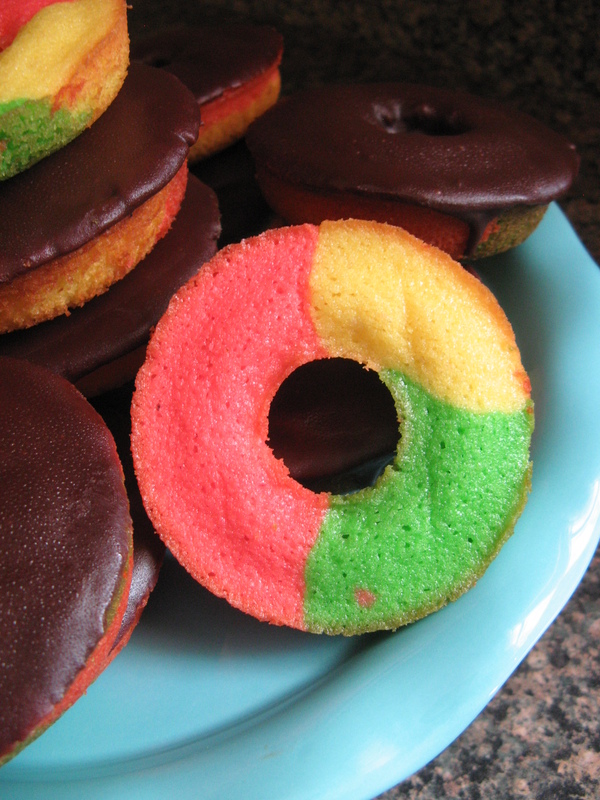 And there you have it… Rainbow Cookie Donuts. While I enjoy the cookie version, I really love the lightness of these donut versions. The almond flavor really shines through as opposed to the cookies where the raspberry jam flavor stands out more for me. Truth be told, the donuts are delicious on their own without the melted raspberry and chocolate glaze. I kept the sans raspberry and chocolate glaze version in an airtight container at room temperature for three days and they still tasted delicious and I kept the raspberry chocolate glaze versions in the fridge for a day or two longer and they still tasted good – I let them come to room temperature before enjoying. Spray two donut pans with baking spray and preheat the oven to 350 F degrees. Using a hand mixer or a stand mixer, cream the butter and sugar together on medium speed until light and fluffy, about 5 minutes. Add the eggs and continue beating for a few more minutes until combined. Add in the grated almond paste, almond extract and milk and beat well until combined, making sure the almond paste is completely incorporated. In a separate bowl sift together the flour and baking powder and gradually add it to the butter batter while mixing on low. Continue mixing until the two mixtures are well combined. Divide the batter among three bowl and tint it with the food coloring. Transfer the batter to three piping bags and snip the ends off. You could also use Ziploc bags and snip one of the corners off. Pipe the batter into the cavities of the donut pan haphazardly to create a marbled effect. Fill the cavities about 3/4 full. Tap the pans down before placing the oven to even the batter down. Bake for about 12-15 minutes, or until a cake tester inserted comes out clean. Let the donuts cool in the pans for a few minutes and then transfer to a wire rack to cool completely. Rinse and spray the pans again before piping in the next batch of batter. Once the donuts have cooled, melt the raspberry in a small saucepan over medium-low heat, do not let it boil. Using a pastry brush, brush the tops of the donuts with the raspberry jam. As the jam settles make the glaze by heating the chocolate, cream, vanilla and salt in a small saucepan over medium-low heat, stirring, until melted and smooth. Remove from the heat and let cool for 5 minutes. Give the mixture a few good stirs. Place a cooling rack on a wax-lined cookie sheet and then dip the tops of the donuts into the melted chocolate and place on the cooling rack so the chocolate can cool and set.